What a wonderful way to begin my day, seated in the darkened auditorium at the Webb City High School Performing Arts Building, watching as the Carl Junction High School Wind Ensemble took the stage. Today was the Southwest State Band Competition. This ensemble, sharply dressed in black, came to attention as their teacher and director, Mr. Scott Schneider, stood poised on the platform, arms raised. 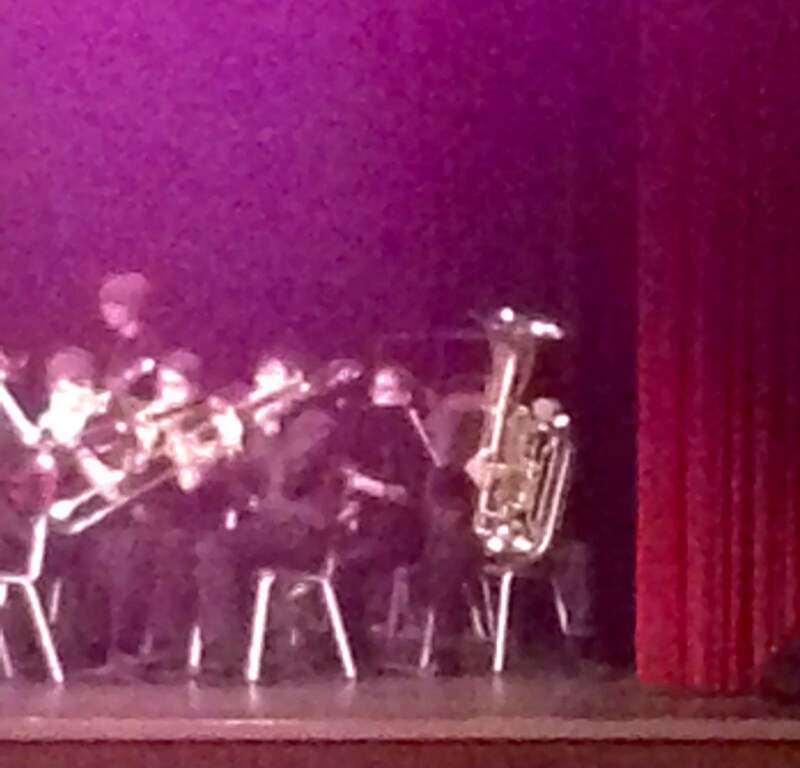 My grandson, Dayan, seated at the end of the row, sat straight and tall, his tuba ready. Two pieces were performed today, for the judges. Parents, grandparents, and students dotted the auditorium, observing as well. The first number was called Chant and Jubilo, composed by W. Francis McBeth. It began slowly, reminiscent of a Gregorian chant, the wind instruments in unison. Then came the dramatic “jubilo” part with an explosion of brass and percussion. I enjoyed listening and watching, amazed as always, at the level of skill these high schoolers have. As the musical piece concluded, to audience applause, I heard a man behind me whisper his approval with one word….”outstanding”. The second, and final, piece was Africa: Ceremony, Song and Ritual, by Robert W. Smith. What a wonderful selection for a competition. Mysterious and intriguing, the music stirred my heart and soul. Driven by the percussion section, this work was multicultural and earthy, fascinating to listen to. I wanted to whoop at the end, however, I observed decorum and applauded, with fervor. It was a wonderful performance, and such an invigorating way to really wake up, and enter into my day. I love music. I am more of a listener and an appreciator of music, rather than possessing any musical abilities. My grandson amazes me, with his talent and his courage to perform. Music enlarges me, broadens my perceptions, raises my awareness. Listening today, enchanted, I was reminded again how representative of life an orchestra or band is, as each person plays particular notes on his or her instrument. Each brings his or her gift of music to the whole, creating a much greater, richer sound than can be shared alone. Each note, each beautiful sound, contributes. Oh, if I can remember to play my own “notes”, contribute my own unique sound, rather than be concerned with what anyone else is contributing…or even not contributing. I can’t give my best, if I am looking over someone else’s shoulder, trying to see if they are playing correctly. What a wonderful reminder this morning to offer, and allow others to offer. 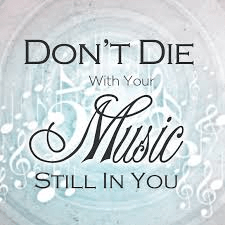 Dr. Wayne Dyer says, “Don’t die with your music still in you” which to me means, to allow my gifts and talents to shine, contribute from my heart without holding back, give of myself to the world, joining in with the sweet notes of others, without worrying about what others are offering. Tuba, flute, piano, drum, cow bell, kazoo…we all have a part to play, a sound to contribute. Thank you, Carl Junction Wind Ensemble, for starting my day so beautifully and for reminding me of these deeper truths. And congratulations for scoring all 1’s, in all categories, the highest ranking possible. I’m not surprised!